Parking Issues – Russley Business Park – Avonhead Community Group Inc. In 2012, the Council gave resource consent to the Russley Business Park development right next to residential streets. Since then, the residents of Fenhall, Pinehurst, Bentley and Penwood Streets have had to put up with staff parking their vehicles outside their homes throughout the day, so that there is no space for the residents’ own vehicles or those of visitors and tradespeople. One lady writes that her husband nearly had a serious accident on his scooter when he was turning from Fenhall Street to Bently Street because a courier came down the middle of the road, owing to cars being parked on both sides of the streets. Council granted resource consent to the business development without ensuring that there were enough on-site parking spaces. As a result, staff have had to park on nearby streets. 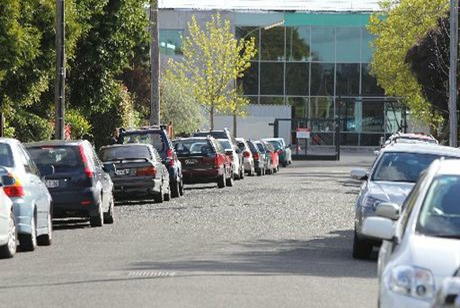 Council first tried to resolve the issues by putting 120-minute parking limits. But this exacerbated the problem, since residents or their visitors themselves could not park their vehicles outside their own properties, while staff simply swapped parking spaces every two hours. Issued 2,630 infringement notices for time limit infringements. In April 2017, the ACG submitted before the Fendalton-Waimairi-Harewood Community Board, pointing out these issues. Our submission can be read here. The Council tried to fix the issues by implementing a 1-hour parking limit instead (so that staff wouldn’t have time to swap car parks) and also installed a full-time parking warden. The issues remain. Many of the residents on Fenhall and Pinehurst Street have relocated because they can’t put up with this anymore. The ACG is lobbying for a “residents only” parking permit that allows residents and their visitors to keep their vehicles parked in front of their houses notwithstanding parking limits that apply to others. Do you have any suggestions? Let us know using the details on our “Contact Us” page.